Gardening with kids can help kids develop patience and kindness. But, kids can also really screw up a garden! I know my boys can drive me crazy picking flowers instead of weeds or stomping on all of the young plants. However, teaching kids a little about gardening while reading books about gardens, can make gardening into a fun family activity and help kids show kindness to the Earth. After reading Lois Ehlert's "Planting a Rainbow" and "Growing Vegetable Soup", we were inspired to create our own way of labeling our garden plants. 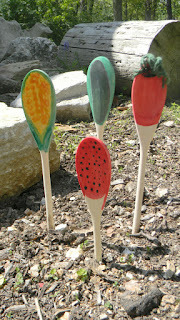 We used wooden spoons from the craft store and painted each one to look like a vegetable. Clicking on the images will take you to the book on Amazon. These are affiliate links. For the corn, we painted yellow and green and used qtips to make the kernels. For the tomato, we added a vine by gluing yarn to the top. For the strawberry, we painted red and then dotted with black seeds. We also made a cucumber by painting the spoon green. It needed a little more life to it so we used a picture from the internet and used Mod Podge to glue the picture to the spoon. Once the spoons were finished, we covered with a coat of outdoor Mod Podge to seal the paint. This will help your garden markers hold up in the outdoors even better. Today I am participating in a Google + hangout on Crafty Kindness for the Earth. 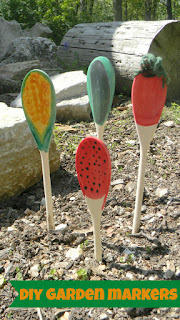 I'll be sharing my DIY garden markers that we made this week while reading garden books. Each week, +Megan Sheakoski from Coffee Cups and Crayons hosts a Acts of Kindness for Kids hangout. Since Earth Day was this week, this week's hangout is on the topic of helping kids show kindness to the Earth. We're focusing on crafts for kids that show kindness. You can join us live on April 25 at 11 am EST. Watch on G+ or here at ready-set-read.com. I'll be joined by +Carolyn Elbert , +Erica MomandKiddo , +Holly Homer , and hosted by Megan. 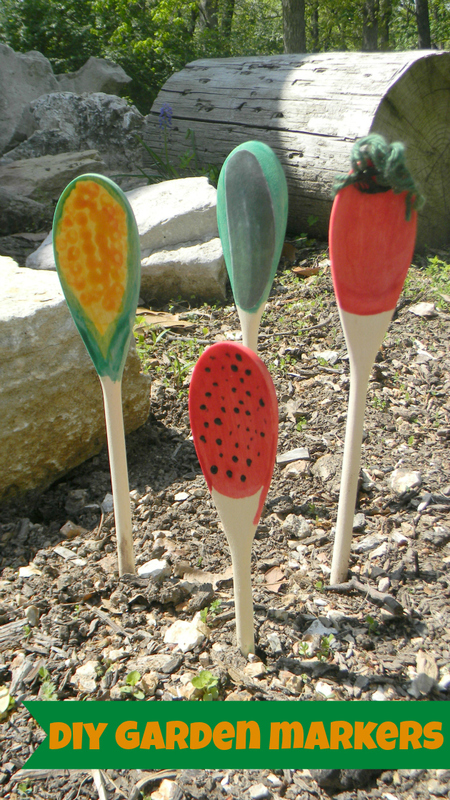 Come find out how to make these garden markers as well as other crafts for kids. If you can't join live the video will be available after the hangout to watch. Jackie - these are adorable! I love that they are so easy for the kids to do. Our Discover & Explore theme this week is Gardening with Kids - would love to have you link up! Thanks Jacquie, I will head over and link up. These are so cute! I really love them. I pinned this post. Thanks! I'd love to see any that any other readers make. I think there are so many different fruits and vegetables you could do. Those are pretty cute! Thanks for sharing them at Mom's Library! Those garden markers are adorable!